What problem do the cystine stones cause? What happens with a urinary obstruction? What is the effect of urinary obstruction on the kidney? What are the signs and symptoms of cystinuria? What use is early diagnosis? How long has cystinuria been known? Cystinuria is an inherited (genetic) disorder of the transport of an amino acid (a building block of protein) called cystine resulting in cystinuria (an excess of cystine in the urine) and the formation of cystine stones. Small stones are passed in the urine. However, big stones remain in the kidney (nephrolithiasis) impairing the outflow of urine while medium size stones make their way from the kidney into the ureter and lodge there further blocking the flow of urine (urinary obstruction). Obstruction of the urinary tract puts pressure back up on the ureter and kidney. It causes the ureter to widen (dilate) and the kidney to become compressed. Obstruction of the urinary tract also causes the urine to be stagnant (not moving). Stagnant urine is an open invitation to repeated urinary tract infections. The pressure on the kidneys and the urinary infections result in damage to the kidneys. The damage can progress to renal insufficiency and end-stage kidney disease which require renal dialysis or a kidney transplant. Because of the potential effectiveness of treatment, early diagnosis of cystinuria is important in all persons, regardless of age, who form urinary stones. Failure to diagnose cystinuria early and treat it consistently with the utmost vigor can result in morbidity (illness) and mortality (death). Survival may depend upon dialysis or a kidney transplant. Penicillamine: For people with cystinuria in whom a consistent, conscientious high fluid intake does not succeed in halting the formation of stones, another option available is regular treatment with a drug called penicillamine. Penicillamine (Cuprimine, Depen) acts to form a complex with cystine that is 50 times more soluble than cystine itself. The side effects of penicillamine are rarely severe enough to prevent its use. Percutaneous nephrolithotripsy (PCNL): The stones in cystinuria are too dense to be broken up by shock waves produced outside the body (extracorporeal shock wave lithotripsy) as can be done with some other types of common kidney stones. Instead, a technique designed for removing dense (and very large) stones is utilized: percutaneousnephrolithotripsy (PCNL). PCNL is performed via a port created by puncturing the kidney through the skin and enlarging the access port to 1 cm (about 3/8 inch) in diameter. There is no surgical incision. PCNL is done under real-time live x-ray control (fluoroscopy). Because x-rays are involved, a super-specialist in radiology (an interventional radiologist) may perform this part of the procedure. The endourologist (another subspecialist) then inserts instruments via this port into the kidney to break up the stone and remove most of the debris from the stone. In 1810 Wollaston found a yellow bladder stone composed of an unusual substance which he named cystic oxide since it came from the bladder (Greek kystis = bladder). Analysis showed it to be an amino acid. Thus, the bladder gave its name not only to the amino acid cystine but also to the disease cystinuria. In 1908 Sir Archibald Garrod first put forth the concept of inborn errors of metabolism. The 4 inborn errors of metabolism that Garrod considered were albinism, alkaptonuria, pentosuria, and cystinuria. 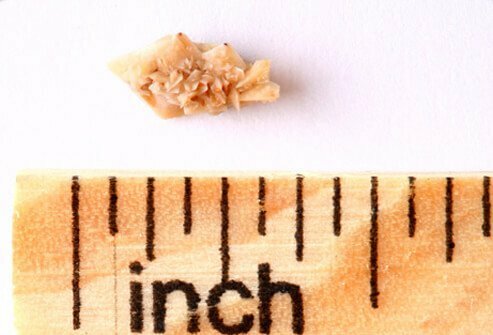 View a Picture of Kidney Stone Crystal and learn more about Additional Conditions. What were your symptoms associated with cystinuria? What kinds of treatment were effective for cystinuria? How did you keep track of your fluid intake? Do you have a family history of cystinuria? Please describe your experience with cystine kidney stones. Taking prescription medications or over-the-counter drugs or supplements should be discussed with your doctor. There are some medications that have been found to cause no problems in pregnancy, however, medications such as Accutane for acne, should never be taken during pregnancy.